We are currently out of stock, we apologize for the invonvenience, please try again later as we hope to get more stock shortly. LEGAL DISCLAIMER: PhotoBlocker is perfectly legal to purchase, however may NOT be legal to use. 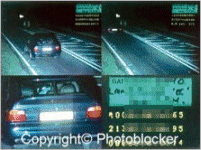 While applications of PhotoBlocker are undetectable, we do NOT advise using it to defraud the UK driving system. Would YOU like to make your car INVISIBLE to speed cameras? NO more fines. NO more points. NO more sudden flashes on the motorway. Wouldn't that just be a dream come true? Well, now you CAN -- Thanks to PHOTOBLOCKER! The brand new, patented PhotoBlocker spray STOPS you from getting caught by speed cameras -- by automatically REFLECTING the light of the camera flash, like a mirror. 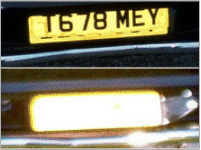 The reflected light overexposes the image, making your number plate ABSOLUTELY UNREADABLE. It works EVERY TIME. And that means NO FINE and NO POINTS! Regular drivers will be able to see your car number plate as normal, and it's UNDETECTABLE to the naked eye. Police officers will have no idea. But you will NEVER get caught speeding again! This USA phenomenon has JUST arrived in the United Kingdom, and it's EASY to use. Already GOT a ticket? Click here to learn how to beat it! ... "PHOTOBLOCKER WORKS WITHOUT A DOUBT!" Click HERE to see just a few of the recent media reports! 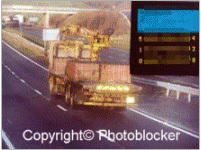 If you've EVER driven on the public road system, you NEED PhotoBlocker -- before the product is BANNED. Only YOU will know about PhotoBlocker! 100% LEGAL to buy... for now! It's LEGAL to buy PhotoBlocker, but not legal to use it. And it won't be on sale after 2019! The Government knew that PhotoBlocker was coming to the UK. And they were SO WORRIED over the threat it posed to the MILLIONS the Government earns each month in speeding fines, that way back in MARCH 10TH 2005, the Government announced legislation that could make the spray ILLEGAL by the end of 2019! The Government is panicking. It doesn't want YOU to have PhotoBlocker. That means you NEED to order your stock of PhotoBlocker NOW... Before it's too LATE! 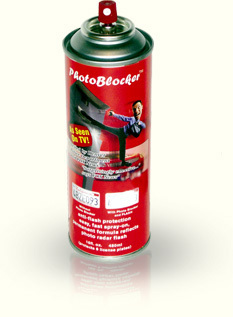 Interested in grabbing your own tin of PhotoBlocker -- NOW? We've obtained a LIMITED STOCK, exclusively for our UK customers! And we're offering to deliver this brilliant, controversial product STRAIGHT to your door for the DISCOUNTED PRICE of just £19.99 plus P&P. PLUS, if you purchase MORE than one tin BEFORE midnight Monday, February 25th 2019, you'll receive FURTHER big discounts AND reduced postage and packaging. That means combined savings of £5 on two cans and £15 on three cans! - Each tin comes with a 30 day money-back guarantee. - We have dozens of media reports to prove it works! REMEMBER: Stock is EXTREMELY LIMITED! Please note that we are offering PhotoBlocker for a VERY LIMITED PERIOD ONLY. The special prices we are currently offering are only guaranteed on a daily basis. We reserve the right to increase pricing or discontinue sale without prior notice. Each tin protects up to TWO CARS. We recommend reapplying every SIX MONTHS. BUY WITH CONFIDENCE: This is the REAL DEAL! We are the ONLY OFFICIAL UK DISTRIBUTOR of PhotoBlocker & the official trademark holder within the United Kingdom! BEST BUY - SAVE £15!! Live in EUROPE? No problem. Just CLICK HERE to view our European delivery page. VAT added at 17.5%. We accept all major credit cards and cheques. Just click the link to order. All orders shipped via recorded delivery and may require a signature. We respect your privacy and do NOT share your details with any other organizations. Got questions? Read our FREQUENTLY ASKED QUESTIONS. Alternatively, contact us direct. SELL to your FRIENDS: If you are looking to retail multiple tins yourself, please contact us directly to discuss bulk pricing. 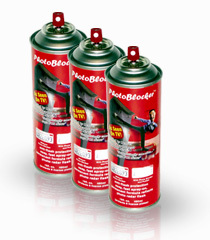 We can offer PhotoBlocker for as low as £10 per tin, with a minimum order of 20. This product may be removed from the site in the near future. Do NOT rely on visiting this site again in the near future and receiving the low prices currently listed here. As the legislation approaches, the price of the tins (if available) will ONLY increase. Get on board now. 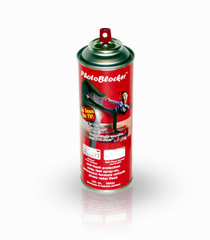 Grab your PhotoBlocker spray TODAY! Please note that we do NOT condone unsafe driving. However we're also AGAINST outrageous fines and crazed actions taken by the Government in the interest of "road safety". PS. Remember, PhotoBlocker will be made ILLEGAL to purchase at the end of 2019. However, once applied PhotoBlocker CANNOT be detected. So why not buy a few tins to keep in stock? Click HERE to buy a three pack! PPS. Beware of IMITATIONS! Imitation may be a sincere form of flattery. But would you prefer hairspray with a fancy label... or a genuine product that hides your numberplate from speed cameras? PhotoBlocker is the ORIGINAL. You cannot beat it. Only buy genuine! PPPS. PhotoBlocker UK... PhotoBlocker UK... PhotoBlocker UK... Yes, this site is the LEADING provider of PhotoBlocker within the UK. And even WE only have around 60 tins left, as we head toward the end of 2019. So if you think you just MIGHT want a tin, then grab one now, while you still can! 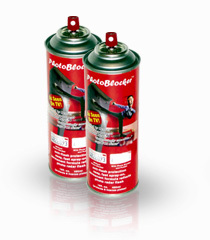 PhotoBlocker UK Home | PhotoBlocker FAQ | PhotoBlocker Media Reports | Contact Us | BUY NOW!